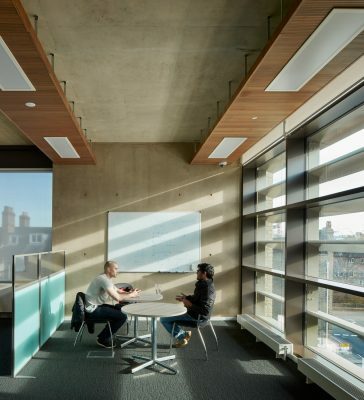 The new extension consists of nearly 2,900m2 of postgraduate research and teaching space over four floors, providing open-plan research floors, academic offices, meeting rooms and support spaces. 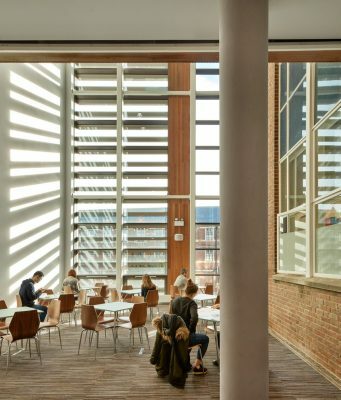 Additional seminar spaces are provided on the ground floor and further teaching and break-out areas are located within a glazed element that links the new facility to the existing Baker Building at each level. 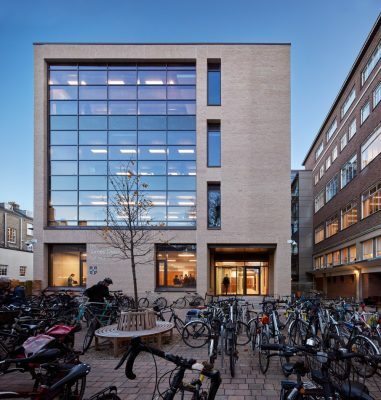 “This new space for Britain’s best engineers at the University of Cambridge will catalyse great technological breakthroughs that transform how we live”. The department’s campus is very congested with little space for further expansion. Our brief was therefore to maximise the amount of usable space that would be available for the researchers. This has been achieved by using the in-situ concrete frame to create a large, column-free floorplate (approx. 10m x 38m) on each floor which provides the flexibility for research groups to grow and shrink over time. The Department set a very challenging annual energy use target of 100kWh/m2 for combined regulated and unregulated energy. 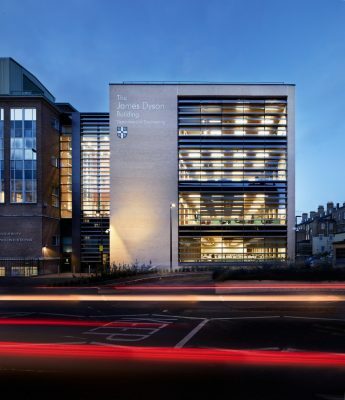 This target will be met through a variety of strategies, including extensive use of assisted natural ventilation (using Breathing Building units) with heat recovery, natural daylight, an exposed in-situ concrete structure, photovoltaic arrays and the use of LED lighting. There is no mechanical cooling and the building is highly insulated and has a demandingly low infiltration rate. The building itself will also be an exciting and innovative research tool. 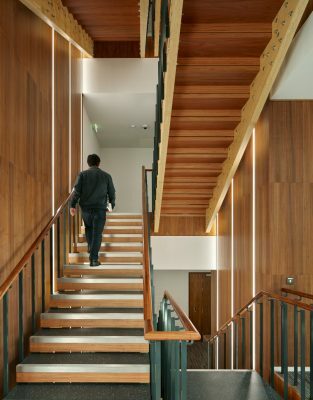 NHA worked with a number of the post-graduate research groups to provide opportunities for monitoring the building structure and incorporate materials or components into discrete areas of the building. These include the incorporation of sensors within the building structure as well as the discreet use of innovative materials such as negative carbon blockwork using magnesium etc. Our work on this aspect of the project involved acknowledging the academic cycle and availability (and non-availability) of research groups through the year, and also the important role of the contractor in implementing and allowing for the experiments to be built within their own costs and programme. 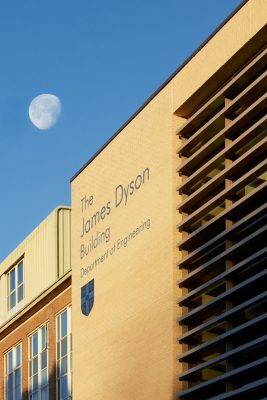 The James Dyson Building and the Dyson Centre for Engineering Design at the University of Cambridge officially opened earlier in May 2016. 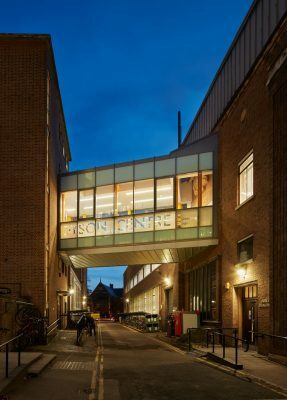 The technology hub was designed by Nicholas Hare Architects and funded in part by a £8m donation from the James Dyson Foundation, and will give some of the world’s brightest young engineering students access to advanced laboratories. 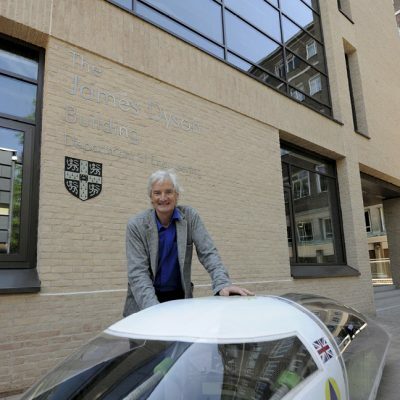 The James Dyson Building for Engineering will support world leading research in areas including advanced materials, smart infrastructure and electric vehicles. Fibre-optic sensors in the foundation, piles, columns and floor feed back live data, about temperature and strain – providing a picture of how the building is behaving. The result is a building that’s more of a living creature than a passive block of material: we can ask the building how it’s feeling, and the building can reply. 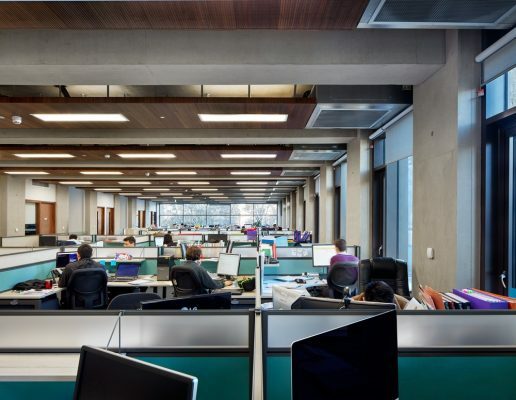 The Dyson Centre for Engineering Design will teach students about the design process – and provide space for over 1,200 undergraduate engineers to conduct their research.